Peel the release paper from the shoulder patch and apply it to the skin overlying the lateral deltoid muscle. The adhesive is a water based low allergy pressure sensitive adhesive designed for long term application to the skin. The distal wrist gauntlet is attached just proximal to the wrist and is fixed with a hook and loop system. Some people with neurogenic arm pain are sensitive to even light pressure around the wrist. If this is the case then the wrist gauntlet should be used with an adhesive patch to prevent the gauntlet from slipping and then loosely closed using the hook and loop. material. The length of the brace strap should be adjusted so that when reaching forward with the brace on the pain is not produced; or if the pain is initially constantly present the pain should not increase. 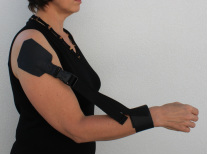 If the changes in pain due to reaching are latent (ie onset or increase in pain hours after the movement is performed) then the brace should be adjusted to limit elbow extension by 45 degrees. The brace should initially be worn continually if possible; even when showering and sleeping. As the pain improves the angle of restriction should be gradually reduced. With further improvement the brace may be worn only during potentially provocative activities. When worn the brace should be un-clipped at the buckle every hour or so and the elbow fully straightened while keeping the arm by the side of the body. To avoid the elbow stiffening up the strap should be un-clipped every hour or so. This should be done with the arm by the side. The elbow should be bent and straightened a few times with the arm by the side and re-clipped.